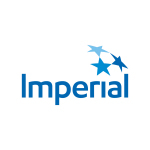 CALGARY, Alberta–(BUSINESS WIRE)–Imperial Oil Limited today declared a quarterly dividend of 19 cents per share on the outstanding common shares of the company, payable on January 1, 2019, to shareholders of record at the close of business on December 3, 2018. This fourth quarter 2018 dividend compares with the third quarter 2018 dividend of 19 cents per share. Imperial has a long and successful history of growth and financial stability in Canada as a leading member of the petroleum industry. The company has paid dividends every year for over a century and has increased its annual dividend payment for 24 consecutive years. After more than a century, Imperial continues to be an industry leader in applying technology and innovation to responsibly develop Canada’s energy resources. As Canada’s largest petroleum refiner, a major producer of crude oil, a key petrochemical producer and a leading fuels marketer from coast to coast, our company remains committed to high standards across all areas of our business.